The Ventus Australis is the new star vessel in the Australis array of ships and will be launched in January 2018. This luxurious ship consists of 100 cabins and can hold up to 210 passengers. It is tailor-made for exploring the remote Southern tip of South America which means that all aspects of it - from size, length, draft, and engine power - have been designed to accommodate the needs of a vessel that travels through locations that require extra maneuverability such as; narrows fjords and channels. To find your perfect Patagonia cruise, simply call our Travel Specialists on 0208 546 6222. Board the beautiful newly built Ventus ship in Punta Arenas between 1-5PM. As usual on all Australis cruises, you will start the journey with a welcoming toast and introduction to of the captain and crew. Fall asleep to a completely different landscape as the ship enters the Whiteside Canal between Darwin Island and Isla Grande de Tierra del Fuego. On the second day of your trip you will go ashore at Ainsworth Bay, which harbors a huge amount of bird life and a colony of southern elephant seals which can sometimes be spotted from the Zodiacs. You can choose between two different guided excursions: one takes you on a hike along the crest of a glacial moraine, the other will be along the edge of a stream and pristine sub-polar forest. Both will provide views of Marinelli Glacier and the Darwin Mountains. In the morning you will enter Pia Fjord where you will board the Zodiacs for a Pia Glacier tour. The fun doesn't end here as right after you will take a short hike that will unleash a stunning panoramic view of the spectacular glacier, which extends from the mountaintops down to the sea. 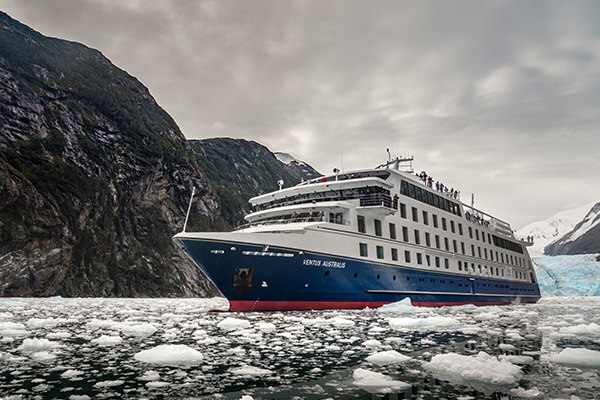 Later on, you will board the ship and continue the cruise east along the Beagle Channel through Glacier Alley. This passage is very famous for featuring a number of impressive tidewater glaciers flowing down from the Darwin Mountains and Darwin Ice Sheet on the north shore. If you hear someone shouting the names of European countries, fear not, they are not trying to change the destinations of your cruise, but simply stating the names of the glaciers you are passing by - Holland, Italy, Germany, Spain, and France! On this day you will visit Wuluaia Bay which known for having both interesting landscapes and human heritage - the bay was described by Charles Darwin and sketched by Captain FitzRoy in the 1830s during their voyages on the HMS Beagle. The area is absolutely stunning which is a direct cause of its dramatic geography. Later on, you will have the possibility of choosing one out of three different hikes. In the afternoon you will continue cruising but this time heading to Cape Horn National Park. This remote archipelago harbors the legendary Cape Horn often referred to as "End of the Earth". The park was also declared a World Biosphere Reserve by UNESCO in 2005 so you can easily understand why this is such an unmissable destination. In the following morning, you'll arrive in Argentine waters and dock in Ushuaia, where your Ventus cruise will end its memorable journey. In this Fjords of Tierra del Fuego cruise, you will enter a world of unique beauty where nature is all you need to feel balanced and happy. It's a 4-day journey through some of the best Patagonia locations. You will be on board Australi's newest ship - Ventus - which a luxurious that consists of 100 cabins and can hold up to 210 passengers. Make sure to have your camera charged at all times as you will literally want to capture every moment on board. You will see the Ainsworth Bay, the massive Pia Glacier and Glacier Alley, as well as the mystical Wulaia Bay and the legendary Cape Horn. It will be easy to get on board but very hard to leave! What is It Like on the Fjords of Tierra del Fuego Cruise? Constructed in 2010 the Stella Australis is a luxurious ship which consists of 100 cabins and can hold up to 210 passengers.